The Northern Flicker (Colaptes auratus) is an indigenous species of the woodpecker family, and it is found in nearly all of North America, parts of Central America, Cuba, and the Cayman Islands. This species is part of the genus Colaptes which encompasses 12 New World woodpeckers. There are two living and one extinct subspecies of C. auratus. It goes by at least one hundred names. They include: clape, gaffer woodpecker, harry-wicket, heigh-ho, wake-up, walk-up, wick-up, yarrup, and gawker bird. The sounds of the birds’ vocalizations has led to some of these names. The Eastern race is also known as "Yellow-shafted Flicker" or "'Yellowhammer" in reference to the yellow markings and hammering noises they make as they peck on woody surfaces in preparation of their nest site or when excavating insects. The Western Race is commonly referred to as "Red-shafted Flicker," named so as the yellow of the Eastern form is replaced by red markings. In 1927, the "Yellowhammer" became the official State Bird of Alabama. During the Civil War, the State was nicknamed the 'Yellowhammer State.' Some argue that this nickname was inspired by the yellow tinged grey uniforms of Confederate soldiers; others state that this nickname was inspired by soldiers parading in uniforms with yellow trims. Either way, the Alabama soldiers reminded people of the Yellowhammers - the woodpeckers with yellow patches under their wings. Northern Flickers are both ground and arboreal predators. Unlike most woodpeckers, however, they seek their prey while perching on horizontal branches rather than propping themselves against their tails on a trunk. Their undulated flight is a result of their wing movements; they alternate between wing flapping and gliding, thus gaining and losing altitude. This is one of the few woodpecker species that migrates. Their migratory habits depend on the subspecies and the region in which they live. Northern populations tend to migrate in late autumn to spend the winters in the southeastern United States, while southern populations remain in their territories. Although most northern birds head south, a few individuals often remain in the northern climates. Groups will migrate together and can consist of a few to a hundred individuals. There is some movement among the non-migrating subspecies; they will travel to areas in which they can find shelter from winter weather in coniferous forests and swamps. Other populations remain in their territories but move from higher to lower elevations. Birds that breed farther south typically remain there for the winter. 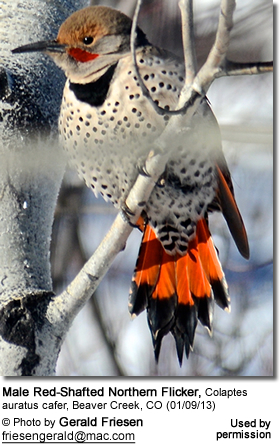 Flickers maintain winter home ranges, but it is not known if they defend these areas. First-year adults may return to their natal area to breed for the first time, while mature adults return to their specific breeding grounds year after year. To find Northern Flickers, try scanning the ground while walking through open woods or forest edges. Flickers often leave their feeding sites for the shelter of the trees when disturbed. Their white rump patch identifies them in flight, as does their loud, ringing call and their piercing yelp. In late summer, listen for the incessant calls of hungry nestlings. The oldest known Yellow-shafted Northern Flicker lived to be at least 9 years 2 months old, and the oldest known Red-shafted Northern Flicker lived to be at least 8 years 9 months old. Northern Flickers are found throughout the North American continent from below the tree line in Alaska and Canada to Mexico, Central America, and Cuba. Northern Flickers inhabit woodlands, forest edges, open forests, groves, orchards, farms, and semi-open country. They also frequent city parks which have scattered trees. In the western mountains, they prefer forested areas, including burned forests, all the way up to the tree line. Some populations prefer riparian areas, such as streamside woods, flooded swamps, and marsh edges. They have adapted well to human habitation, settling in urban and rural areas, suburban back yards, and woodlots. They nest near clearings or other open areas, at forest edges, and in forests interspersed with meadows, fields, and clear-cuts. Nests are also found in savannas and near swamps, ponds, and recently flooded areas containing snags. Northern Flicker numbers have declined over the past 20 years; nevertheless, they are still considered of “Least Concern.” This decline is the result of competition with the European Starling for nest sites and the removal of dead and dying trees. Although the decline hasn’t reached threatening levels, it is important to monitor the population, for these birds are one of the main species responsible for excavating holes and providing nest sites for many secondary cavity-nesting birds. 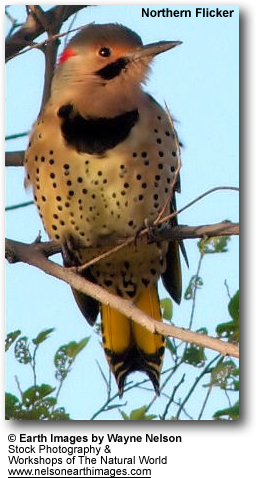 The Northern Flicker family included, in the past, the Gilded Flicker (C. a. chrysoides) - a Sonoran Desert species. However, the Gilded Flicker, has recently reached full species status. Each of the subspecies is distinguishable by its feather coloration and size difference. Two subspecies, the Yellow-shafted Flicker (Colaptes auratus auratus) of eastern North America and the Red-shafted Flicker (C. a. cafer) of western North America, have formed a long, narrow hybrid zone on the Great Plains. This zone parallels the rain-shadow of the Rocky Mountains and crosses the Canadian Rockies to reach southern Alaska. For over 100 years, ornithologists and evolutionary biologists have taken a particular interest in this zone. The Red-shafted and Gilded have hybridized on a smaller scale. ID: Yellow under the tail and underwings and have yellow shafts on their primaries (longest wing feathers). Grey cap, beige face and red bar at the nape (lower back of their neck). Males have a black moustache. ID: Red under the tail and underwings and have red shafts on their primaries (longest wing feathers). Beige cap and a grey face. Males have a red moustache. Range: Highlands of southern Mexico, south to northwestern Nicaragua. Guadalupe Flicker Colaptes auratus/cafer rufipileus extinct c. 1910. A mid-to-large-sized woodpecker, the Northern Flicker measures 28–36 cm (11–14 in) in length and 42–54 cm (17–21 in) in wingspan. The body mass can vary from 86 to 167 g (3.0 to 5.9 oz). Birds dwelling in the northern ranges, such as Alaska or Newfoundland and Labrador, are larger than those living in the southern ranges; these smaller birds are from the Grand Cayman Island. 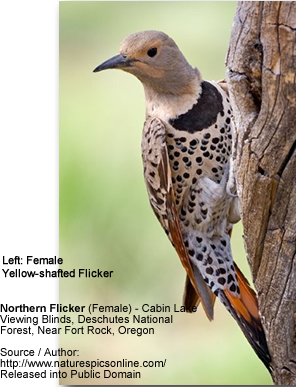 Two easily distinguished races of Northern Flickers reside in North America: the Yellow-shafted form of the East, which occurs into Texas and the Great Plains, and the Red-shafted form of the West. The Yellow-shafted possesses flight feathers that are lemon yellow, while the Red-shafted’s flight feathers are a rosy red. In addition, Yellow-shafted forms have tan faces, gray crowns, and a red crescent on the nape of the neck. Males have a black mustache stripe. Red-shafted forms have a gray face, brown crown, and no nape crescent, and the males display a red mustache stripe. Hybrids have features of both and are common where their ranges overlap. 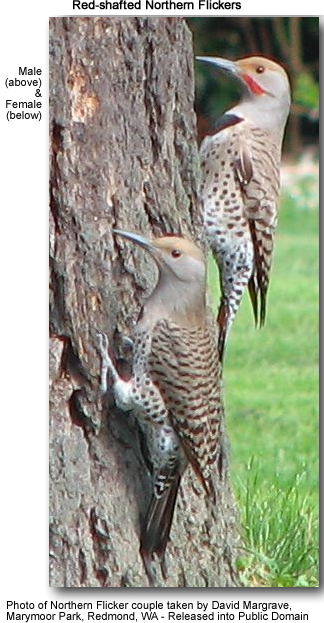 Male and female Northern Flickers are monomorphic and difficult to tell apart. Overall, their plumage is grayish brown, and there is horizontal barring across the back and wings. The tail is white with brownish black bars and solid black tips. The breast is light brown to off-white and displays brown/black spots. The upper breast sports a black crescent-shaped patch, or bib, and the upperparts are barred. The underparts are spotted. The plumage on the wings and tail can be either bright yellow or salmon, depending on the subspecies. Subspecies also differ in throat color, crown color, and the presence of a red blaze at the nape of the neck. The face bears a gentle expression and striking black-scalloped plumage. Flickers’ heads are slim and rounded, with the bill being slightly down-curved. The long, flared tail tapers to a point. Males possess a malar stripe, or mustache, extending from the base of the bill downward below the cheek. This mark is either red or black, depending on the subspecies. A bright white flash can also be viewed on the rump, both in flight and while the bird is perched. The under part of the wings and tail are golden and flash when they fly overhead. Juvenile plumage resembles that of the adult, but the colors are less bright. Some features, such as the malar stripe and black bib, are less distinct. 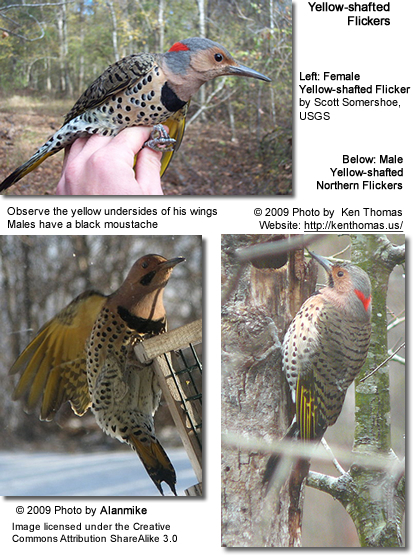 Northern Flickers are the most terrestrial of all North American woodpeckers. They hunt for their prey mainly on the ground; there, they use their curved bill to dig for ants and beetles. They use their long, barbed tongues to lap up the ants; flickers eat more ants than any other bird species in North America. Ants alone make up 45% of their diet. After they eat the ants, flickers have a behavior called “anting,” during which they use the acid from the ants to assist in preening, as it is useful in keeping them free of parasites. These flickers have been seen foraging with other bird species, specifically sparrows and blackbirds, and do most of their foraging in mixed tree woodlands and open ground areas. Their primary food is insects, sometimes catching them in flight. While foraging in the trees, they hunt for beetles, wasps, and caterpillars: they also probe into the bark for insect larvae. Worms, acorns, nuts, and grains make up their diets, and during late autumn, winter, and early spring, flickers consume berries, seeds, and other fruits of wild trees and shrubs. One way to attract woodpeckers is to leave dead branches or trees on your property. These snags attract the kind of insects woodpeckers feed on, and they are also used to excavate nest holes. When the woodpeckers are through using the cavity other birds may move in. Flickers will attend suet feeders in the back yard; they are also attracted by feeders containing black oil sunflower seeds and mealworms. They can be attracted to the yard by placing bird baths or other water sources near a few trees and shrubs. Next to the Downy, the flicker is the most common woodpecker to visit urban areas and back yard feeders. The northern populations of flickers return to their breeding ground from mid-March to early April. A few weeks after their arrival, courtship begins. By late April and early May, pairs have bonded and begun to breed. These birds are monogamous and mate for life, although a bird may find a new mate to replace one that has died or disappeared. During breeding season, males will engage in aerial confrontations while the females simply look on. In these, the two males face each other on a branch, bills pointed upward, and bob their heads in time while drawing a loop or figure-eight pattern in the air, often giving rhythmic wicka calls at the same time. Northern Flickers choose dead or diseased tree trunks or large branches in which to dig their nest holes. In the northern parts of North America, they seek out trembling aspens, since they are susceptible to heartrot; this disease makes the trees easy to excavate. Nests are generally placed 6-15 feet off the ground, but on rare occasions the birds have been known to build them as high as 100 feet. They seek open areas with scattered trees, but will use posts and birdhouses if the size and location suit them. They breed in the forests of North America and as far south as Central America. They sometimes will find an old, earthen burrows previously built by Belted Kingfishers or Bank Swallows to use. The birds prefer to excavate their own cavities, but they will reuse and repair damaged or abandoned nests that they or another species had excavated in a previous year. Their nests, in turn, will provide secondary nesting sites for other birds or animals when they have finished with them. Flickers are sometimes driven from nesting sites by another cavity nester, European starlings. Not the strongest of excavators, the Northern Flicker will choose easy material to work with—mainly digging in dead or decaying tree trunks that are weathered and have weak wood. The location depends on the presence of weak wood, not on the presence of a particular tree species. In addition, flicker nests have been found in poles, stumps, wooden buildings, fence posts, haystacks, and ground burrows. If a person wishes to provide a nest box, he must be sure he packs it tightly with sawdust so the birds have something to excavate. The nest entrance is around 4 inches, and the cavity is usually 10 to 18 inches deep. The more closely the nest box imitates a "punky" tree (soft or rotted), the more desirable it will appear to Northern Flickers. Like so many of the birds in the woodpecker family, the males choose the nest site and do most of the excavating. He uses drumming, calling, and displays to court his mate and defend their territory. In these displays, he will spread his wings and tail while swinging his head from side to side. It takes 12 to 15 days for both the male and female to excavate the nest; they create an opening that is about 3 inches in diameter, and the cavity itself measures 13-16 inches deep. It widens at the bottom to make room for both the eggs and the incubating adult. It is lined with a bed of wood chips for the eggs and chicks to rest on. The female will lay anywhere from 5 to 8 smooth, glossy white eggs. Northern Flickers usually raise one brood per breeding season, unless the first brood is lost; then they might make an attempt at another brood, but in the southern part of the range, pairs frequently raise two clutches. Their eggs are the second largest of the North American woodpecker species, exceeded only by the Pileated Woodpecker's. She will lay one egg per day; the earlier in the season the eggs are laid, the larger the clutch is likely to be. Incubation lasts 11-13 days, and both parents incubate; the male becomes more attentive as incubation time goes on, and will take the night duty. The nest is never left alone. The young hatch within one to two days of each other. Shortly after hatching, the young produce a unique buzzing sound which continues until the chicks are ready to fledge. Researchers believe this sound is meant to frighten away predators. Around the 17th day, the nestlings begin clinging to the cavity wall rather than sitting on the floor. They will climb to the entrance in about 18 days, meeting the parents for food, and they will remain in the nest for a total of 24-27 days. The parents coax the young to leave the nest by withholding food and calling to them. By then, the fledglings are able to fly short distances; once out of the nest, they will remain away from the nest sight, even though the parents will continue to feed and protect them for another two to three weeks. Family groups are often seen feeding together into late summer. During courtship and egg-laying, both parents aggressively defend their territory; this includes the nest site and its immediate surroundings. Vocalizations and "drumming" are used to define and defend territory boundaries. Once incubation begins, the defensive behavior ceases, and they concentrate on the eggs, while other birds are permitted to nest nearby. Northern Flickers are easy to recognize—their call is a loud, ringing sound, and in the summer, the young can be heard calling for food and trying to find their nests. Their drumming is a communication device and a defense mechanism used to ward of invaders in their territories. Like other woodpeckers, they drum on trees, but in order to create the loudest noise possible, they will drum on metal objects or the most resonant wood they can find. The constant knocking sound can be heard for long distances. 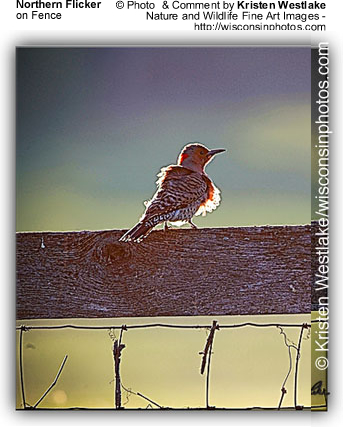 One Northern Flicker in Wyoming could be heard drumming on an abandoned tractor from a half-mile away. This bird's call is a sustained, pleasant laugh, “ki ki ki ki”. The song is a loud “wick wick wick, ki-ki-ki.” They also make a vocalization during aggressive moments and courtship which is a loud “flick-a flicka,” a sound that has given it its name. Woodpeckers do three types of pecking: loud rapid drumming on hollow trees used to define a territory, keep track of a mate, or search of a mate; softer pecking, while hunting for food and chipping at trees; and pecking done during cavity excavation, primarily done in soft or partially rotted wood.